The BEx series Xenon Explosion Proof Beacons are suitable for Zone 1, 2, 21 & 22 applications. Approved to IECEx, ATEX, Ex EAC and INMETRO standards. 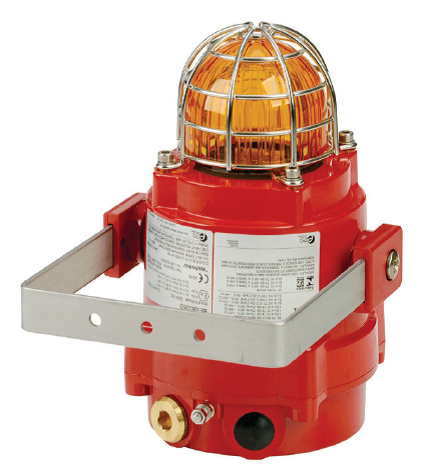 The BEx series beacons robust construction enables installation in the harshest of environments. Additional features include automatic synchronisation on multi-beacon systems and stainless steel guard and mounting bracket as standard. The BEx range features enclosures manufactured from corrosion proof, marine grade copper free LM6 aluminium with a chromate and powder coat finish. All models have two M20 cable entries, large termination areas containing in & out terminals and an ingress protection of IP66/67. – 5J, 10J, 15J xenon strobe beacons. – Ex d IIC zone 1, 2, 21 and 22 (IECEx). – Synchronized flash or flip-flop alternating mode on multi-beacon systems (synchronization or flip-flop modes on multi-beacon systems on a single supply). – SIL2 compliant version available (5J and 10J 24VDC only). – Line monitoring with blocking diode or optional EOL resistor. – Light Intensity: 5J – 120cd(e), 10J – 380cd(e), 15J – 468cd(e). – Protection Rating: IP66 (IP67). – Temp Rating (degrees Celsius): T4 -50 to +70, T5 -50 to +45; BExBG10 & BExBG15 – T3 -50 to +70, T4 -50 to +50. – Cable Entry: 2 x M20 ISO (one stopping plug included). – Construction: LM6 aluminium housing, glass lens, stainless steel guard and mounting bracket. – Approval: 5J – II 2G Ex d IIC T4 (max ambient temperature +70 degrees C), II 2G Ex d IIC T5 (max ambient temperature +45 degrees C), 10J and 15J – II 2G Ex d IIC T4 (max ambient temperature +50 degrees C), II 2G Ex d IIC T3 (max ambient temperature +70 degrees C), II 2D Ex tD A21 IP67 T125 (DIP). – Certificate: IECEx (KEM 10.0002). – Weight: DC – 2.45kg, AC – 2.75kg. – Lens Colors Available: Amber, Blue, Clear, Green, Red, Yellow. ESS7101X BExBG05DP – 5J xenon beacons, 10-14VDC, 750mA. ESS7111X BexBG05DP – 5J xenon beacons, 20-28VDC, 300mA. ESS7141X BexBG05DP – 5J xenon beacons, 42-54VDC, 180mA. ESS7121X BexBG05DP – 5J xenon beacons, 115VAC +/- 10%, 140mA. ESS7131X BexBG05DP – 5J xenon beacons, 230VAC +/- 10%, 55mA. ESS7102X BExBG10DP – 10J xenon beacons, 10-14VDC, 1.45A. ESS7112X BExBG10DP – 10J xenon beacons, 20-28VDC, 660mA. ESS7142X BExBG10DP – 10J xenon beacons, 42-54VDC, 340mA. ESS7122X BExBG10DP – 10J xenon beacons, 115VAC +/- 10%, 250mA. ESS7132X BExBG10DP – 10J xenon beacons, 230VAC +/- 10%, 110mA. ESS7113X BExBG15DP – 15J xenon beacons, 20-28VDC, 860mA. ESS7143X BExBG15DP – 15J xenon beacons, 42-54VDC, 480mA. ESS7123X BExBG15DP – 15J xenon beacons, 115VAC +/- 10%, 360mA. ESS7133X BExBG15DP – 15J xenon beacons, 230VAC +/- 10%, 170mA.